Daulatabad Fort is considered as one of the most coveted forts of India. Rs 5/-. Still cameras are free but there is a fee of Rs 25 for video cameras. 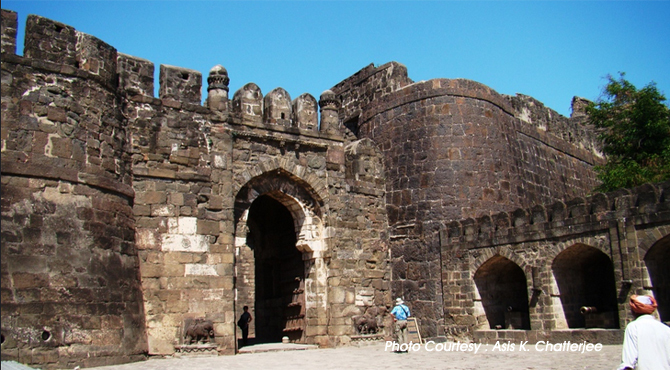 Located on a pyramid shaped hilltop to the north - west of Aurangabad, Daualabad fort is considered as one of the most spectacular forts in Maharashtra. Overshadowed by a rock that rises 183 m above the plain, Daulatabad Fort is considered as one of the most coveted forts of India. Built by the Rashtrakuta kings who built the world famous Kailas caves, the fort was ruled by the Yadavas between 1187 to 1318 AD. In 1924, Allaudin Khilji stormed Daulatabad. Previously known as Deogiri, it was renamed Daulatabad 'City of Fortune' by Mohammed-bin-Tuglak who shifted his capital from Delhi to the impregnable fort 1100 km away (He thinks that Delhi is too far north for his ambition to capture the whole of Hindustan). It was here in 1347, Hasan Gangu Bahamani established the Bahamaini kingdom, shifting soon after to Gulbarga and they ruled here over 150 years. The fort was held as a fine fortress by successive dynasties in the Deccan until it was taken over by the Nizams of Hyderabad in 1724 A.D. which was under their control till independence. The Daulatabad fort, built on a 200 metre high conical hill, has beautiful buildings and an ingenious defense systems. The fort area is divided into three zones. The outer one, 5-km long Amberkot covers the Modern town of Daulatabad. Besides these, there are few ancient builidngs including a hammam, wells and religious sites. The National Highway 211, connecting Aurangabad to Ellora passes through the area covered by Amberkot. The second one, Mahakot, enclosing an area with a radius of half a km is currently the boundary of the fort for all practical purposes. It consists of a double wall with number of bastions. Around Mahakot, surrounding the fort is a water body. Out of the eight gates, the first gate is the main visitor's entrance. The third one is Balakot which is protected by a rock-cut trench has a splendid entrance gate leading to the ancient caves. A number of cannons can still be found on the bastions of the fort. A stairway into the rock leads leads to a Mughal Baradari, built for Shah Jehan's visit in 1636. Inside the fort there are royal and religious structures that are now in ruins. The main structures at Daulatabad are the Jami Masjid and Chand Minar. The fort's central pink minaret, Chand Minar (the Tower of the Moon) looked down over the approach from the north and east and laid a defensive as well as religious role in Daualatabad Fort. Sultan Ala-ud-din Bahmani (Sultan Ahmed Shah II), a king of the Bahmani Dynasty built this in memory of his capture of the fort. The 110 ft Chandminar is the second tallest tower in India after the Qutb Minar. Stands atop the 200 m high hill, the minar has four storeys with Gorgeous Persian glazed tiles and carved motifs. A brass crescent moon crowns the top of this Minar. Jama Masjid, the oldest Islamic monument at Daualatabad. Built by the Khilji ruler of Delhi, Qutubuddin Mubarak in 1318, it is located immediately south of the east-west path leading from the main gate to the fort. Jami Masjid consists of a spacious courtyard considered as the largest in Southern India. One can enter the mosque through domed chambers approached by a flight of steps. The prayer hall consists of 106 carved columns arranged in 25 walkways, is said to have been recycled from Hindu and Jain temples. Now the mosque converted into the temple of Shri Bharata Mata. The royal quarters feature pavilions, and courts which are now in a ruined condition. One of the few well-preserved structures is the 'Chini Mahal' or Chinese Palace. It is located within the Kalakot just past the gate. The last king of Golconda, Abdul Hasan Tana Shah was imprisoned here for 12 years until his death by the Mughal emperor Aurangzeb. The blue Chinese tiles that once covered this palace earned it the name Chini Mahal. The other preserved structure in the fort is Elephant tank. It was the water supply system of the Fort. The water was channeled through two large terracotta pipes channel from the hills to the fruit and vegetable gardens of Daulatabad.